Almost wordless: Early in the morning the prairie was filled with blooming Spiderwort plants. I’ve heard about spiderwort but I’ve never seen it. So beautiful! so pretty! We caught the same thing today. Never knew the name. Looks pretty. Lovely! I have a Spiderwort in my front garden and it’s gotten huge over the years. I liked them so much in the prairie that I bought one at the garden center for my front yard. 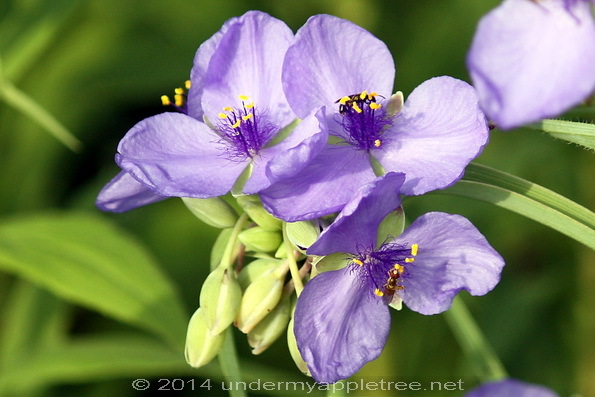 We have spiderwort here too in northern NM and it is my favorite wildflower. I wonder if they are a bulb or rhizome, because they come back in the same place each year. Mine comes back every year too. I don’t think they are bulbs. They make seed but they don’t seem to self-seed, so I’m going to take some cuttings and try to make a few more plants. I love this plant, I have it around our pond and it looks great. So lovely! The color is wonderful.